When I saw this post at Cookies and Cups, I knew I had to give it a try! She made apples out of Oreos, and I decided to try my luck with pumpkins. These are so incredibly easy and fun to make! And your kids will love them! Melt the orange candy melts according to the package directions. 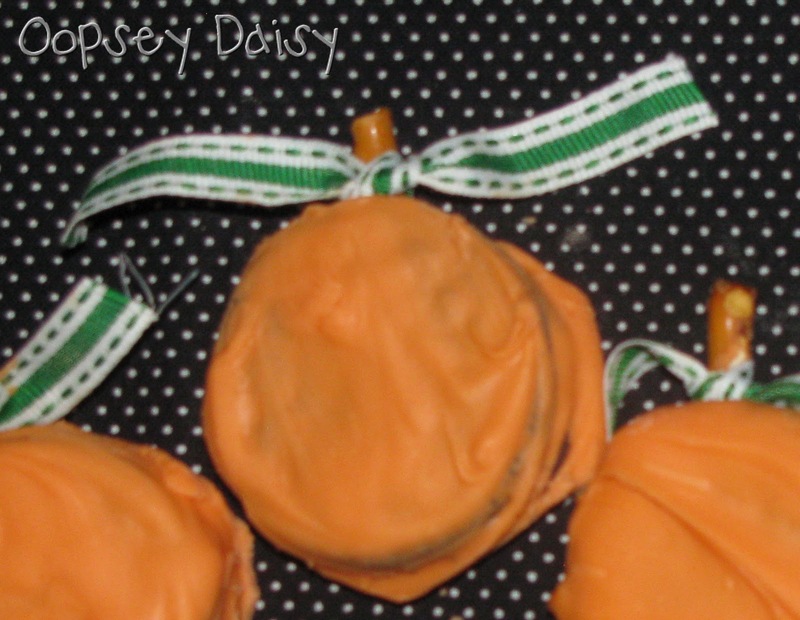 Using a dipping stick, dip an Oreo into the orange candy melt. (I wasn't very good at this, and I ended up just spreading the candy melt all over the Oreos!) Let set on wax paper. Stick a half pretzel stick into the top to create the pumpkin's stem. Tie green ribbon around the stem to form the leaves. Enjoy! How fun would it be to decorate these to create jack-o-lanterns?! I think we'll wait until Little Man is just a bit older for that! Enjoy! So cute! I have some Oreos laying around, I might have to make pumpkins! Very cute! I might have to try this. Chocolate covered oreos = yummmm! These are just adorable! The ribbon really tops them off! bah so cute!! this will be so fun to give to my hubby's squad mates!! For the love…that is cute! Love these! Oreos are definitely a staple food in our house. thanks for sharing! Yum! These would also be fun with RP Peanut Butter Cups! Oh goodness, so stinkin cute but more importantly so EASY!!! Whoohoo I think even I can make these:) They are adorable, I am adding the ingredients to my grocery shopping list right after I comment. Thanks for linking up to A Crafty Soiree, I always love what you do! As always, appreciate your participation and hope you'll come by again next week! Wow! This is fantastic! I hope you'll come link it up to my Halloween party this weekend. http://www.whilehewasnapping.blogspot.com. It would be such a great addition! It looks so tasty! there are the cutest!!!! I will have to make some for sure. Instead of ribbon I would be purchasing either watermelon fruit by the foot and cut them and tie around or the fruit licorce so the kids can eat all of it and you don't waste your pretty ribbon 🙂 Will have to use this for an afternoon snack for my kiddos! Thanks for sharing. Wow, it's so easy…I can't wait to make them! Thanks for sharing! Very cute idea! I love anything that is dipped. Oreo's are a great idea! These look delicious and easy—just my type of project! Thanks for sharing! Great idea, and they look so yummy, just one question…what are orange candy melts? I feel so inept! These are so cute and look so yummy! 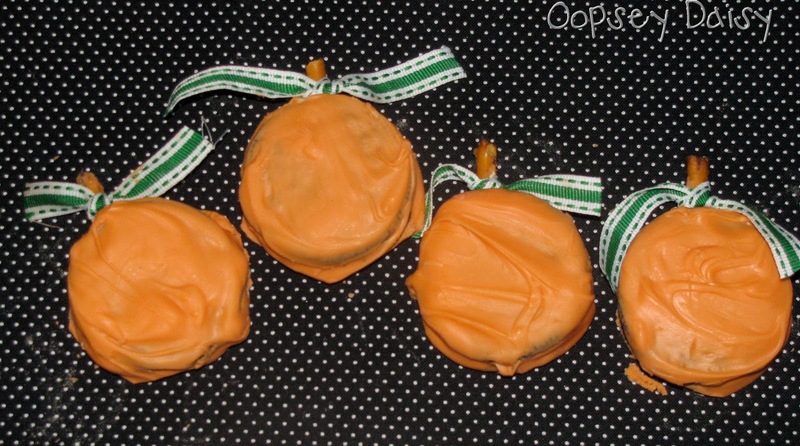 I dipped oreos in green chocolate for last St. Patrick's day….they were sooooo delicious! I am showing this off on Monday! These are DARLING!!! I love them!! I'll be featuring today, so come by and grab a button!! I think if you put the pretzel stick in the oreo first and then freeze them (or at least chill them), then you could dip them in the orange melt and pull it out easily. Can you tell me where I can buy Orange candy melts? I can't find them! I did find that putting the sticks in the candy and then letting them harden in the freezer was helpful! They turned out SO cute and everyone loved them! Thank you and I love your blog! a few years from now, I'll make these with my grandbaby. Oh, heck, I know my hubby would love 'em right now! Chocolate covered Oreos are delicious with M&Ms stuck on them, too. You can also cover Nutter Butters with chocolate and candy pieces. I call them "potluck cookies" because they're so easy to whip up before a gathering, and everyone loves them and thinks you're a hero and a culinary genius for making them. My recipe for chocolate covered potluck cookies is here.